Anniversaries reinforce the love bond with new memories and shared experiences. These are the precious moments of time that bring you closer with those you love. We are providing you with the most loved expressions, wishes and toasts they will always remember. We are blending tradition with fresh inspirations to increase your love bond. Every year is important and you must have something affectionate, in-expensive and over-the-top to make the anniversary one of a kind. 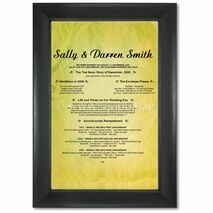 Make the special day more special with these Anniversary Frames and be a part of their love and warmth ever.